A great way to start the New Year is to get organized. To some folks that’s a huge undertaking. However, you can break it down to a simple mantra of “A place for everything and everything in its place.” Designate where you want the shoes to go when the family comes home whether that’s a rug by the door or in their rooms. Same for coats, scarves, hats and gloves. Don’t just toss them around. Next find a place for magazines, mail and keys. If you’ve got kids with toys then you know how they can end up scattered everywhere. Give the kids a special place for their toys and have them put them away every night before bed. You’ll be starting some new habits but you’re home will look a lot less cluttered. Speaking of starting something new, you could start a new home improvement project for the New Year. Maybe there is a room you’re not using but could benefit from a fresh coat of paint or thorough cleaning. You could hang up a painting or photos you’ve kept in a closet and transform that space into something wonderful. Maybe the basement has become a storage area instead of a decent family room. Maybe it’s time to break up a pair of siblings who have been sharing a room by converting an attic space into a new bedroom. Even if you all you do is create a quiet zone for mediation you’ll be making great strides towards improving your life. Keep in mind that you won’t have to do this alone. 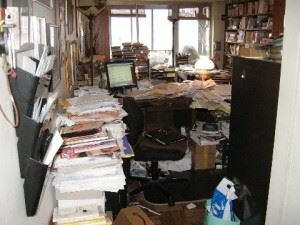 If you hire Junk King Denver you’ll be bringing on a strong crew to help with all the clutter removal. You don’t want to hire Junk King just to take away all your old magazines. Where Junk King can be a great benefit is helping you toss out those oversized items that are taking up space. This is where reclaiming a spare room or basement comes into play. If those areas have become storage dumps for your family then isn’t it time to take back that space? Junk King can show you the way. Hiring Junk King means you’ll not only be getting that able-bodied crew but you’ll also be getting full use of their truck. Don’t worry: you won’t have to drive! All you have to do is decide what want to be loaded onto that truck. The Junk King crew will do all the rest of the work. What’s the cost for that amazing service? One fee that will be based on how much space your junk will take up on the truck. Junk King Denver will let you keep your home improvement resolution without breaking a sweat! This entry was posted in De Clutter, Denver Furniture Pickup, Denver Junk Removal, Denver Junk Removal Price, Junk King Denver and tagged Denver Clutter Removal, Denver De Clutter, Junk Hauling Denver on January 30, 2013 by Paul Durant. Last updated August 1, 2017 . A positive New Year’s resolution you should consider applying to your life is rethinking how you clean your home. Now, if you’re happy with the way you house is kept up then you’re ahead of the game but there could always be room for improvement. One method that has grown in popularity is the idea of speed cleaning. This is where you take a fast and thorough approach to your cleaning chores. But just because you’re cutting back on your time doesn’t mean your home will be any less clean. First of all schedule a weekly cleaning time. Setting aside that time should be something that you make part of your weekly routine. There is an exception to this resolution and that would be with your clothes and/or dishes. These should be taken care of daily. Clothes go into the hamper and dishes get done every night. For your weekly cleanup routine, get yourself a handy carryall where you can keep all your rags, cleaning supplies and rubber gloves. This carryall is something you can easily transport from room to room. It’s also a good idea to have an apron with pockets. That’s where you can put your toothbrush while you’re cleaning the bathroom. It can also be where you can place any loose change, buttons or other small items you might collect on your route. As you go through a room, it’s best to work clockwise wiping, dusting and cleaning as you go. Once that is completed then move onto the mopping and sweeping. This seems like common sense but you’d be amazed at how many folks get scattered when it comes to cleaning and they end up wasting valuable time moving from room to room without ever finishing the job. If you really want to embrace the speed-cleaning concept then you should enlist the other members of your household. Yes, the idea of cleaning on a Saturday morning might be met with groans and moans but if you can break up the chores so that everyone has an equal share and there are no surprises as to the schedule, then you should be able to cut back on the grumbling. When you incorporate a speed-cleaning routine for the first time you might discover that you’ve got a lot of things that you’re ready to toss out but might not fit into the garbage. These would be any oversized item that is taking up space and collecting dust. Keep the speed-cleaning going by hiring Junk King Denver for this junk removal job. They’ll show up at the schedule appointment time and make a clean sweep through your garage, basement, attic and yard carting off any item you point to. Typically Junk King can accomplish their task in less time than it would take you to thoroughly clean out your oven! Keeping your home clean is a resolution that’s easy to keep with Junk King Denver on your side. This entry was posted in Denver Junk Hauling, Denver Junk Removal, Junk King Denver and tagged Junk King Denver on January 22, 2013 by Paul Durant. Last updated August 1, 2017 .